As a lone traveller, I find myself continuously depending on the hospitality of others. Without it, I’d be lost. 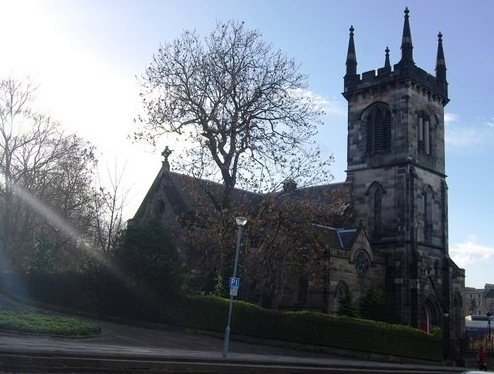 On Sunday, I went to Greenside Parish in Edinburgh for worship. It’s a small church…and getting smaller by the year. I walked in and was immediately swarmed by sweet folks offering a warm welcome. “Where are yea from dear? What brought you to Scotland? How did you find our wee church out of all the others?” I took a seat in the seriously uncomfortable pew and watched as no more than 40 sat down for worship in a sanctuary that could seat at least 400. Lillian, a widow of about 65 sat nearby and immediately struck up a conversation with me. She had worshipped for years at the majestic St. Giles in the center of Edinburgh. After her husband died 6 years ago, she came to tiny, understated, Greenside. “The people here cared about me as I learned to live without my husband,” she said. “No one even asked how I was doing at St Giles. It’s too big there for people to care about one another.” Looks like I picked the right place to visit. After worship, Lillian literally took me by the hand and introduced me to almost everyone there. She repeated this introductory refrain to everyone we met: “This is Kim. She’s visiting from America. She is Presbyterian too. She works with young people in a church in North Carolina. Isn’t it wonderful that she’s here with us!” She stuck to me like glue–so much so that folks thought I was in town visiting Lillian! An easy mistake. She was treating me the way you might if you brought a beloved relative to meet your church family. As a result, I felt right at home in a place I had never set foot in. They all shuffled me down the treacherous stone stairs to have tea in their basement fellowship hall. I was put in the middle of the room as the members took turns introducing themselves and telling how glad they were I was there. What if we did that to the strangers that showed up to worship at our church? What a gift!! Turned out the minister has connections in Greensboro, NC and he was as glad to hear my accent as I was to hear his. He went to college at William and Mary and played against UNC on their basketball team. He recalled it as a “humbling experience”. After talking a little Carolina basketball, I headed out to catch a taxi to the train station to get to Glasgow…but not before Lillian gave me a big hug and wished I’d come back soon. It seemed like she really meant it too. Worship at Greenside Parrish Church was wonderful in the way that putting on your favorite, most comfortable sweater is. Nothing particularly fancy or special but it was familiar and just felt nice. I have worshipped away from UPC or my youth just a few times in the last five years. The separation was a great gift in helping me reconnect to my own spirituality. But too, it helped me recall why I love church in general and especially UPC. At Greenside, there was no “party pew” like some of my UPC youth and families enjoy. In fact, there were no youth and families at all. However, what they lacked in numbers and youth they made up for in true hospitality. Their kindness and welcome made me feel at home in a way nothing else in Edinburgh had. It’s safe to say I now prefer all of my hymns to be sung with a Scottish brogue. Guide Me Oh Thou Great Jehovah has never sounded so fantastic! So much better than my experience in St. Giles.